By the time I left Norway and arrived in Texas as a 20 year old, I had already spent much of my childhood attending American schools in Dubai and Salzburg. You would think I had become acculturated to the American way of life during that time. I spoke English fluently and was, for the most part, culturally fluent. Despite all that, I experienced an enormous culture shock. Fortunately, I was not alone. As Tim and I started our married life, he was missing Europe as much as I was. As I searched for anything that could link me to home, he was right there, leading the way. 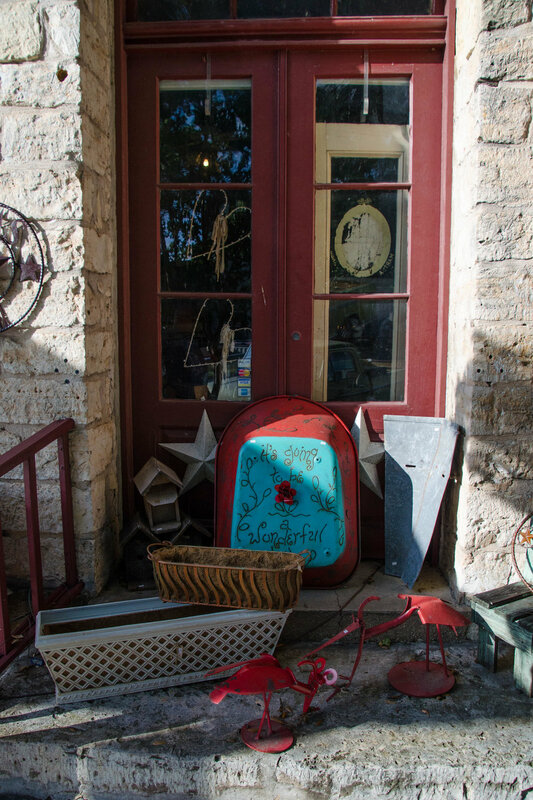 We drove from Austin to Dallas to visit a book store that sold German magazines, we drove to the Norwegian Seamen’s Church in Houston for Norwegian food and newspapers, and we drove to Fredericksburg. Having spent several years in Austria, it was comforting to see all the German names and signs on the stores. Somehow, Fredericksburg brought me a feeling of home. My affection for the little German town, founded in the mid 1800s, has remained. The town has changed a great deal in the 30 years since I first visited. Back then, it seemed every other store sold antiques. When my Danish grandparents came to visit, we took them to Fredericksburg, where my habitually blunt grandmother made the statement “These things aren’t old enough to be called antiques. They’re just old junk.” It was a very European perspective on objects that were in use not long after the area was first settled by pioneering Germans. The items were old in terms of Texas history. These days, you’ll find a much more interesting selection of stores and a variety of places to eat. The town’s inherent charm has become a tourist magnet. The end result of increased visitor numbers is that money has been funneled into building restorations and landscaping that has further increased the town’s attractiveness. 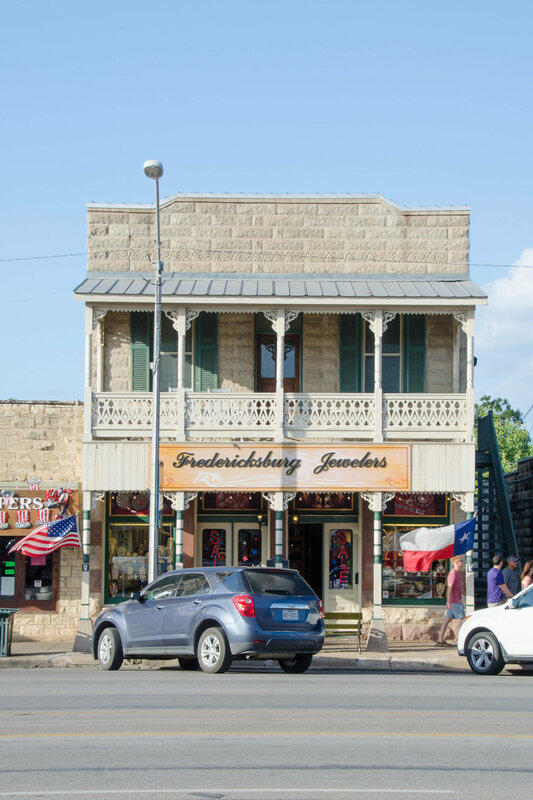 Fredericksburg’s architecture is an interesting mix of storefronts typical of the old west, Hill Country limestone, and the German design influences and building traditions of the early settlers. A search for bed and breakfasts in Fredericksburg will result in a long list of possible, and very tempting choices. Since we were only able to spend one night, we opted to stay at the Fredericksburg Inn & Suites, just a few steps away from Main Street. The hotel has converted an old pioneer house on the property into breakfast facilities. The little black and white house leads my thoughts to the timber-framed houses you see all over Germany and Denmark, and again, Fredericksburg has made me feel at home. Since we only have one evening in Fredericksburg, we make sure to walk the length of Main Street, on both sides. Very soon after starting our walk, the dehydration, after a long day of being out in the sun, leads us to the cool basement of the Rathskeller where a couple of beers (possibly more) revive us. At 6 o’clock in the evening, the sun is still firing heat rays at anyone who dares cross the exposed sidewalk. Fortunately, most of the stores have seen to it that their entrances are covered, which means shoppers are protected from both sun and rain. We’ve been looking forward to enjoying an authentic Wienerschnitzel at the German restaurant Ausländer. When we realize that the restaurant has a breeze-filled outdoor seating area, we choose to eat outside. 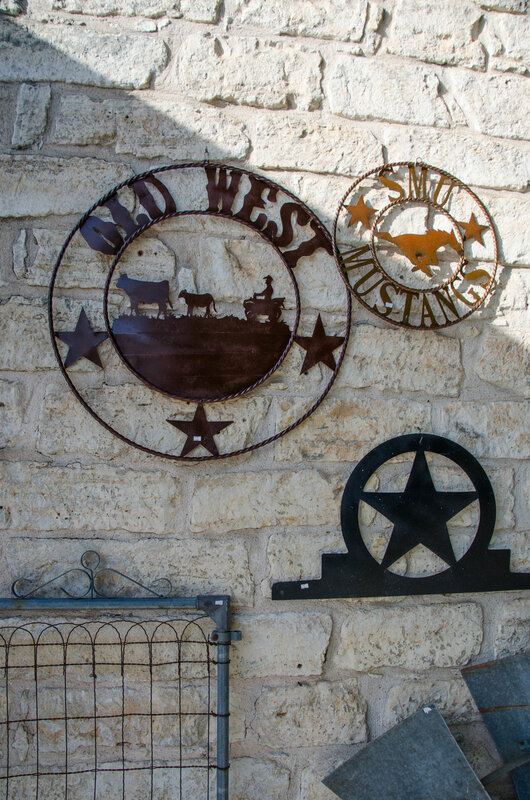 While listening to live country music, we look forward to our meal. The meal is unfortunately not as authentic as expected, but otherwise, very good. The Fredericksburg area offers a variety of activities that should keep visitors busy for a few days. 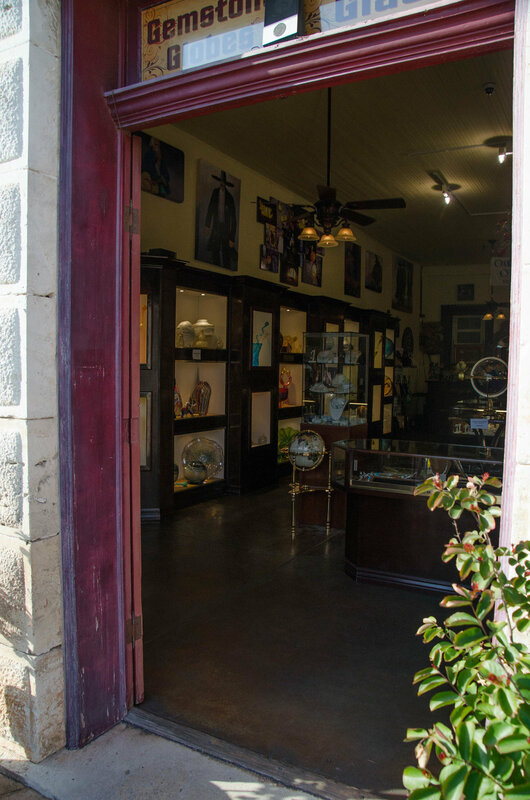 The National Museum of the Pacific War can be found on Main Street. Admiral Chester W. Nimitz was born in Fredericksburg and the museum, the only one in the country completely dedicated to telling the story of the Pacific and Asiatic Theaters in World War II, honors his memory. Wildseed Farms can be found just a few minutes drive east of Fredericksburg. 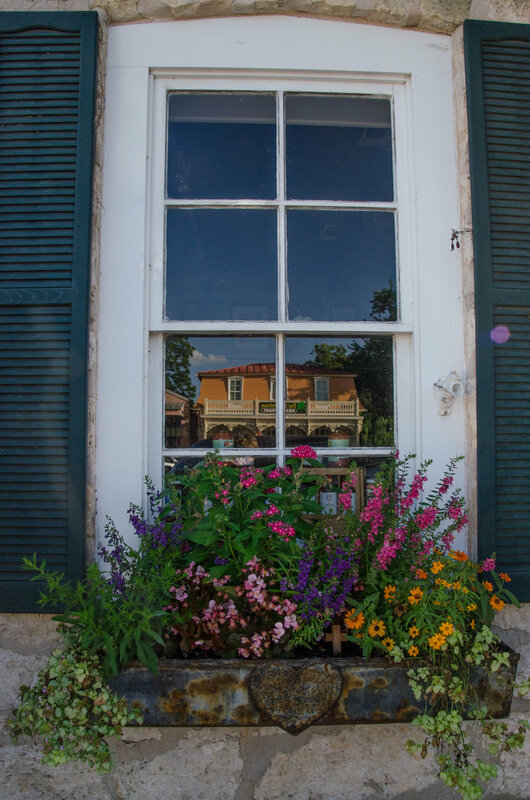 In addition to being a nursery retail center, the farm entices visitors with colorful display gardens and large fields of wildflowers. I included lots of pictures from our July visit in Hill Country Part II. For wine connoisseurs, there are a number of wineries in the area. If beer is more your taste, you won’t have trouble finding a brewery. Fredericksburg also boasts a handful of farms and orchards that might make for a fun visit during the growing season. 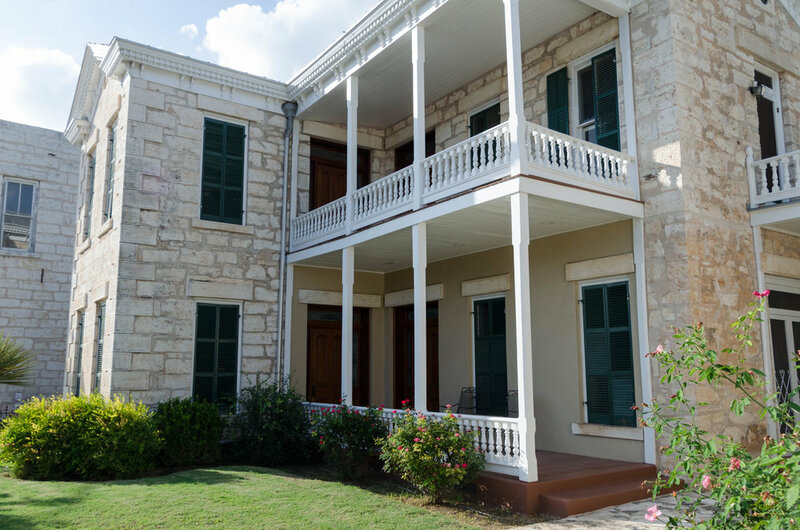 A 25 minute drive to the east will deposit you at the Lyndon B. Johnson State Park and Historic Site. Within the park lies the Sauer-Beckmann Farm, a living history farm, which allows visitors to experience farm life at the turn of the century. It’s possible to tour the LBJ ranch during your visit, but this needs to be arranged at the State Park’s visitor center. The State Park is also home to a herd of Texas Longhorns. I would encourage you to click on the Longhorn link. I had no idea Longhorns have such an interesting history. 25 minutes south of Fredericksburg is Old Tunnel State Park where, from May to October, visitors can view three million Mexican free-tailed bats emerge from the tunnel to begin their nightly hunt for food. Wherever you are in Texas, it’s always a good idea to see if there are any state parks nearby. Enchanted Rock State Park is only a 25 minute drive north of Fredericksburg and well worth a visit. I wouldn’t necessarily recommend a visit during the summer, as there’s very little shade to be found, but at any other time of year you can enjoy beautiful Hill Country scenery and some interesting geology. We had not expected to visit, but an unexpected event enticed us to deviate from our route. Enchanted Rock will be the focus of Hill Country Part V.
The 13 mile Willow City Loop is touted as one of the most beautiful areas of Texas to see spring time wildflowers in bloom. We might just have to return in April. Even without wildflowers, this is a memorable landscape. On the day of our visit, things do not go quite as planned, but more on that in next week’s Hill Country Part IV.